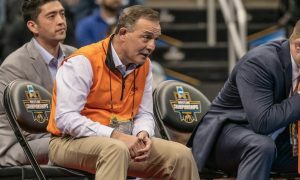 The 2018-19 season is in the books after the conclusion of the 2019 NCAA Championships. As is the usual tradition around such a big event, we have uncovered a boatload of facts, figures, trends, random occurrences, and firsts that took place in Pittsburgh. Before we get started with those, take a look at the seniors that finished their careers as three and four-time All-Americans. After those we’ll jump in to all of the fun. Roman Bravo Young’s (Penn State) eighth-place finish at 133 lbs made him the first All-American to hail from Arizona since Anthony Robles (Arizona State) in 2011. The state of Illinois looks to be back on track. After only having one All-American in 2018, six Illinois natives earned All-American honors this time around. 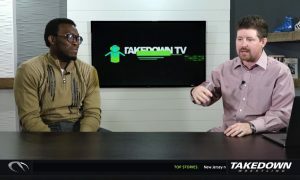 (Austin O’Connor – North Carolina, Larry Early – Old Dominion, Isaiah White – Nebraska, Emery Parker – Illinois, Patrick Brucki – Princeton, Jacob Warner – Iowa). This was the first year since 2006 that the University of Iowa did not produce an All-American from the state of Iowa. Four New Jersey natives won NCAA titles in 2019 (Nick Suriano – Rutgers, Anthony Ashnault – Rutgers, Mekhi Lewis – Virginia Tech, Anthony Cassar – Penn State). This was the first time since 2012 that the state had multiple champions (Kellan Russell – Michigan, Frank Molinaro – Penn State). Zahid Valencia became Arizona State’s first multi-time NCAA Champion since Markus Mollica won a pair of titles in 1993 and 1995. He is also the first Pac-12 (Pac 10) wrestler with multiple national championships since Stephen Neal in 1998-98. Matt Stencel broke a small two-year All-American-less drought for Central Michigan when he was seventh at 285 lbs. In only the second year since the reinstatement of their program, Fresno State crowned an All-American. It was 197 lber Josh Hokit who finished fifth after starting as the 16th seed. The last Bulldog to AA was Marico Botelho, who was eight at the same weight class in 2003. Over the past two NCAA tournaments, 184 lber Emery Parker (Illinois) has went 1-2 in the championship bracket, but 12-2 in the consolations. He has placed third and fifth during these two years. Jarrett Degen (149) and Willie Miklus (197) are the first All-Americans for Kevin Dresser at Iowa State. 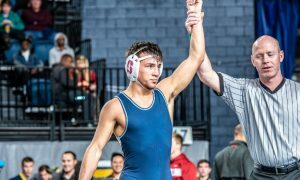 Degen is the Cyclones first All-American since 2016. He is also the first 149 lber to get onto the podium for ISU since Bill Maldonado was sixth in 2002. This is the first time that Lock Haven has had multiple All-Americans in back-to-back years since the 1996 and 1997 seasons. Bald Eagle 165 lber Chance Marsteller became Lock Haven’s first two-time All-American since Mike Maney did so in 2002-03. Daniel Lewis’ fourth-place finish made him only the third four-time All-American in Missouri’s history. 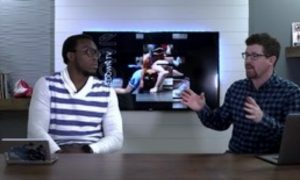 He joins J’Den Cox and Ben Askren. Talk about a replacement! Missouri lost All-American Grant Leeth for the year due to injury and was replaced by true freshman Brock Mauller who proceeded to match Leeth’s 2018 finish by getting sixth in the nation. Michigan had Stevan Micic (133), Alec Pantaleo (157), and Myles Amine (174) finish in third place at their respective weights. They are the first All-Americans for first-year head coach Sean Bormet. Rayvon Foley was seventh at 125. He is Michigan State’s first All-American since 2014 when Mike McClure finished fifth at 285 lbs. Foley is also the first All-American for head coach Roger Chandler. He also became the first Spartan sophomore to get onto the podium since Franklin Gomez was third at 133 in 2008. Gable Steveson is the first freshman All-American for Minnesota since the 2012 season when Chris Dardanes, Dylan Ness, and Logan Storley all accomplished the feat. He is also the first true freshman to earn All-American honors since Nick Gwaizdowski finished eighth for Binghamton in 2012. North Carolina had multiple All-Americans in back-to-back seasons for the first time since the 1994 and 1995 seasons. Tar Heel 149 lber Austin O’Connor’s third-place finish is the highest for a UNC wrestler since Justin Harty was a runner-up in 1996. O’Connor is also their first freshman All-American since Ethan Ramos was sixth at 165 lbs in 2015. Drew Foster won Northern Iowa’s first NCAA title since Tony Davis in 2000. He did not qualify for the NCAA Championships as a freshman after putting together a 15-19 season and was unable to win an Iowa state title either. Ohio State had their seven-year streak of producing at least one national champion per year snapped after going 0-3 in the NCAA finals. 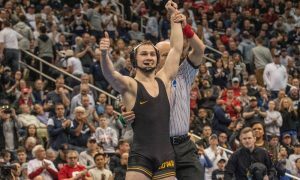 The most recent team to go 0-3 in the NCAA finals is Iowa (Thomas Gilman, Cory Clark, Brandon Sorensen) who did so in 2016. Dom Demas’ fourth-place finish at 141 lbs made him the first All-American of the Lou Roselli-era at Oklahoma. He was also the first All-American for the Sooners since Ryan Millhof and Cody Brewer in 2016. Finally, Dom had the highest finish for an Oklahoma freshman since Joel Flaggert was fourth in 2005. Daton Fix became the first Oklahoma State Cowboy freshman to reach the NCAA finals since Jake Rosholt did so in 2003. A fifth-place finish at 285 lbs made Amar Dhesi the first three-time All-American for Oregon State since Les Gutches back in 1996. 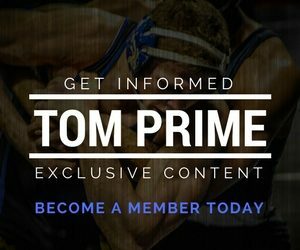 With titles from Jason Nolf, Bo Nickal, and Anthony Cassar, Penn State has the longest current streak with at least one national champion per year. It dates back to 2011, the year of their first NCAA title under Cael Sanderson. Penn State has had a finalist at 174 lb in each of the last five years and six of the last seven (Mark Hall 2017-19, Bo Nickal 2016, Matt Brown 2013 and 2015). 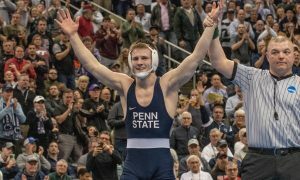 Jason Nolf and Bo Nickal have joined David Taylor as the only four-time NCAA finalists in Penn State history. Patrick Glory’s sixth-place finish at 125 lbs was the highest finish by a Princeton freshman in program history. Anthony Ashnault’s quarterfinal victory clinched top-six status and made him Rutgers first four-time All-American in program history. Later in the tournament, Nick Suriano became the first national champion in school history. Ashnault would match that feat two matches later. 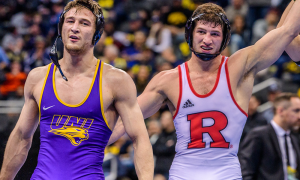 Ashnault and Suriano gave the Scarlet Knights multiple All-Americans for the fourth consecutive season. The ninth-place team finish marks the first time that Rutgers has finished in the top ten at the NCAA Championships. 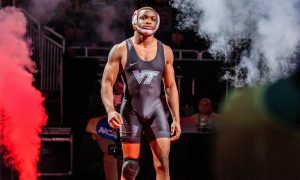 Not only was Mekhi Lewis the first NCAA Champion in the history of Virginia Tech, he was also the first freshman finalist for the Hokies. Previously the highest placement for a Virginia Tech freshman was Joey Dance, who was fourth in 2014. Lewis’ title came after he started as the eighth seed. In the last ten years, only four wrestlers with seeds eight or higher have won titles in the same season. The are Myles Martin (Ohio State) #11 in 2016, Cody Brewer (Oklahoma) #13 in 2015, and Quentin Wright (Penn State) #9 in 2011. Evan Wick (165) and Trent Hillger (285) are the first All-Americans for Chris Bono at Wisconsin. Mekhi Lewis was the only freshman to win a title during the 2019 season. He is now the tenth freshman champion since 2014. Previously, there were only 11 between 1993 and 2013. 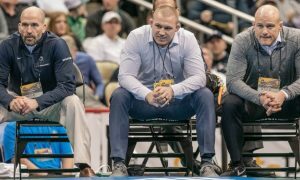 The NCAA final featured a match between two non-freshman that had never earned All-American honors before the 2018-19 season in Cassar and Derek White (Oklahoma State). The last time that we had a final between first-time AA’s was when Mark Ellis (Missouri) defeated Konrad Dudziak (Duke) in 2009. Only four true freshmen were able to get onto the podium this year. Patrick Glory (Princeton), Roman Bravo-Young (Penn State), Brock Mauller (Missouri), and Gable Steveson (Minnesota) were able to do so in Pittsburgh. Tariq Wilson (NC State – 133), Montorie Bridges (Wyoming – 133), and Taylor Venz (Nebraska – 184) are all sophomores that were All-Americans last season, but could not duplicate that feat in 2019. At 197 lbs the top four seeds all wrestled up to their original seeds. Bo Nickal/1st, Kollin Moore/2nd, Preston Weigel/3rd, and Patrick Brucki/4th. This was the only weight class where this occurred in 2019. The last time this happened was in 2016 at 165 with Alex Dieringer/1st, Isaac Jordan/2nd, Bo Jordan/3rd, and Daniel Lewis/4th. One of the biggest first-round upsets came when #26 Ryan Blees (Virginia Tech) took out #7 Kaden Gfeller (Oklahoma State) 5-1 in sudden victory. Blees was in his second season at Virginia Tech after transferring from Oklahoma State. This was the first year that all 33 wrestlers were seeded at each weight. Dakota Geer (Oklahoma State), the 26th seed at 184 lbs became the lowest seed in NCAA history (just this year) to become an All-American when he was seventh at 184 lbs. Speaking of low seeds, #26 Ian Butterbrodt (Brown – 285), #28 Sam Stoll (Iowa – 285), #31 Mason Pengilly (Stanford -133), and #33 Devin Kane (North Carolina – 174) were all seeded lower than 25th, yet battled through the brackets before falling in the consolation Round of 12. #4 Micky Phillipi (Pittsburgh – 133), #4 Josh Alber (Northern Iowa – 141), and #2 Shakur Rasheed (Penn State) are the only wrestlers seeded one through four that did not earn a spot on the podium this year. Since 2014, at least one #2 seed per year has missed out on a spot in the top eight. Rasheed in 2019, Joey Lavallee (Missouri – 157) in 2018, Anthony Collica (Oklahoma State – 2017, Joey Dance (Virginia Tech – 125) and Brian Realbuto (Cornell – 174) in 2016, Michael Moreno (Iowa State – 165) and Max Thomusseit (Pittsburgh – 197) in 2015, and Nick Dardanes (Minnesota – 149) in 2014. 2019 was the fourth consecutive year that saw a Pennsylvania native win a national title at 125 lbs. Spencer Lee has won the last two championships, followed by Darian Cruz (Lehigh), and Nico Megaludis (Penn State). It was also the second year in a row that Spencer Lee on a national title from the #3 seed. In fact, the last #1 to win a championship at 125 lbs was Jesse Delgado (Illinois) in 2014. The streak continued at 285 lbs where either a number one or number two seed has won the title every year since 2001. That year it was fourth-seeded John Lockhart (Illinois) who emerged victorious. During the Round of 12 at 285 lbs, in-state rivals Matt Stencel (Central Michigan) and Mason Parris (Michigan) clashed for the third time this season. Stencel ended up pinning Parris in 2:30. That brought their total time on the mat spent in those three matches up to a total of 3:14. Stencel finished with two falls to Parris’ one. Willie Miklus (Iowa State) became the first wrestler to achieve All-American status four times, yet never placing higher than sixth place during any of those four years. This year there were no pins in the NCAA finals. Each of the last two years featured one, as did three of the last four years. 149 lb All-Americans Austin O’Connor (North Carolina) and Mitch Finesilver (Duke) faced each other six times throughout the 2018-19 season. Both wrestlers were able to come away with three victories, however it was O’Connor who downed Finesilver in the NCAA quarterfinals, along with the third-place match. No other pair of wrestlers in this tournament faced each other six times. For the third year in a row, the NCAA Champion at 133 lbs was a runner-up in the previous season. Nick Suriano (Rutgers) lost in the finals in 2018 at 125 lbs, while the 2018 champ Seth Gross (South Dakota State) lost to Cory Clark in the 2017 finals, after Clark had lost in the 2016 finals to Nahshon Garrett (Cornell). 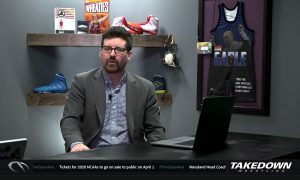 So does either Jack Mueller (Virginia) or Daton Fix (Oklahoma State) win the title in 2020? Former Edinboro wrestlers (Sean Russell – 125, Korbin Myers – 133, Pat Lugo – 149, Dakota Geer – 184, Billy Miller – 285) accounted for 21.5 total and two All-American honors for their new teams. Had their points counted for the Fighting Scots, it would have placed them 23rd in the nation, behind Northwestern and ahead of Virginia. Graduates of Blair Academy (Chas Tucker – Cornell, Joey McKenna – Ohio State, Matt Kolodzik – Princeton, Requir van der Merwe – Stanford, Jordan Kutler – Lehigh, Chase Singletary – Ohio State) accounted for 42.5 team points. That total would have been good enough for a 12th place finish, ahead of Arizona State and Lehigh and is the highest of any high school in the country.